Hotwash Window Cleaning is based in Penwithick in Cornwall near St Austell. The areas they cover are mainly just St Austell and the immediate surrounding area. Their window cleaning service is available on a monthly clean and customer satisfaction is a high priority. Their services include window cleaning and conservatory cleaning using the Pure Water system. The company is fully insured and provide a 24 hour rain guarantee. For more details visit their website. Advance Window Cleaning is a professional cleaning company based in Swindon and are members of the Federation of Window Cleaners. They are fully insured and offer a commercial and residential window cleaning service throughout Swindown and other locations in the Wiltshire area. 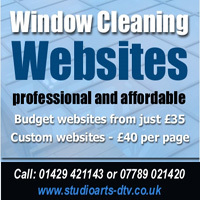 There commercial window cleaning service covers Bristol, Bath, Cheltenham, Gloucester, Oxford and Reading. They offer a quality service and are dedicated to providing customer satisfaction to all of their clients. For further details you can contact them via their website or on the numbers listed below. Operated by the owner Steve Enright, Clear view Windows has gained a good reputation for reliability, friendliness and professionalism. The company provides a comprehensive service for anyone wanting a reputable window cleaning service in the cornwall area including Bodmin, St Austell, Newquay and Wadebridge. Being fully insured and operating to health and safety guidelines, you can be sure their work is carried out to a very high standard using the safest window cleaning methods available. For more information on their services, which also includes conservatory cleaning, gutter cleaning and fascia cleaning, pleae call the number below. PME Window Cleaning Services is based in Bishops Cleeve near Cheltenham in Gloucestershire. They provide a professional window cleaning service, both commercial and residential, and use the latest high reach water fed pole system to clean windows. The company are fully insured with public liability insurance and use highly trained staff to clean their customer’s windows. Areas they cover include Cheltenham, Tewkesbury, Winchcombe, Gloucester and all the surrounding areas. Ultra Clear Window Cleaning based in Westbury-on-Trym near Bristol has over the years gained a solid reputation and provide a first class quality service. They are thoroughly dedicated to providing 100% customer satisfaction. With extensive experience in the window cleaning industry, the company and highly trained staff can provide a comprehensive service for anyone requiring either a regular or one-off window cleaning service in the areas of both South Gloucestershire and North Bristol. Jurassic Coast Window Cleaning is a Devon based window cleaning company located in Colyford and offer a friendly, domestic and commercial window cleaning service covering Axminster, Sidmouth, Seaton, Colyton, Colyford and all the surrounding areas. They use a water fed pole system for pure water cleaning with quality results and also offer related cleaning services including fascia and soffit cleaning, gutter cleaning and conservatory cleaning. Window cleaning Services based in Burton Bradstock in the Bride Valley specialise in all types of window cleaning and also provide a wide range of additional cleaning services including fascia cleaning, solar panel cleaning, gutter cleaning and conservatory cleaning. They are a family owned business and use a hot purified water Reach and Wash’ system as well as traditional methods where required. The company is fully insured and all services are carried out in accordance with health and safety regulations. Risk assessment and method statements are also provided for each client where needed.